CES 2018: The Aurasens smart chair promises to upgrade your AV experience | What Hi-Fi? How do you get even more out of your music and movies? Well, you can always add a chair that vibrates in time with the action. 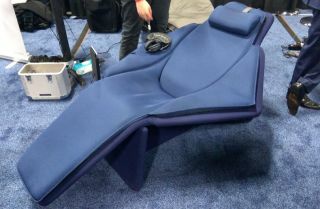 It's been a couple of years since we enjoyed the Gamut Lobster chair that was aimed at audiophiles, and now at CES 2018 there's a new take on the immersive chair experience. French start-up Aurasens prefers "high-tech pod" for its contraption, which combines 32 points of contact on the recliner itself with an iPad control system, a pair of noise-cancelling headphones and a blindfold. Scroll through a selection of music tracks and you can then enjoy something akin to a massage but with the pulsing vibrations coming in time with the music. And it's not just big bass rumbles - parts of the chair do "tap, pulse and tingle", helping to add an extra element to the audio experience. Each track's accompanying set of vibrations is designed manually, so you can't just plug and play with your favourite playlist. Instead Aurasens promises its own catalogue that's growing every month. Available from February for a cool $20,000, Aurasens is hoping to bring a $2000 option to market in the not too distant future. For now, this model is really aimed at the professional market, from cinemas to private functions. Working with Valeo, Aurasens has developed an experience that incorporates VR in to the mix, and cinema screenings with smart chairs like this - similar offerings are already out there - certainly sound like a lot of fun. For now, it's a decent place to rest the legs ahead of the full CES show, which gets up to full speed this week.